We’ve been talking about getting some sort of AI device for some time now, but we weren’t sure which one we wanted to get. Since we shop with Amazon so frequently, and we’re also long-time Prime members, we decided we wanted to get an Amazon device. 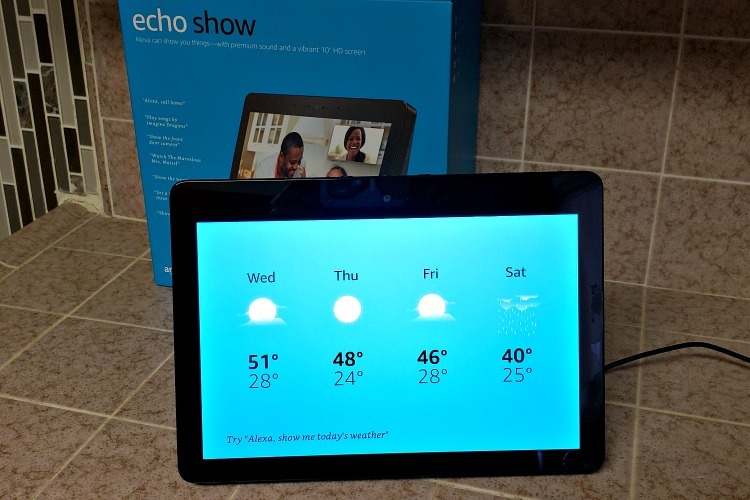 Amazon sent us the all new Echo Show, which I couldn’t have been more thrilled about. Before I get into all of the wonderfulness about the Echo Show, watch me unbox it and show you how it works in less than 2 minutes. Okay, now that you got to see how to unbox and set it up, and saw a few of my favorite Alexa commands, let’s talk more about the Echo Show. 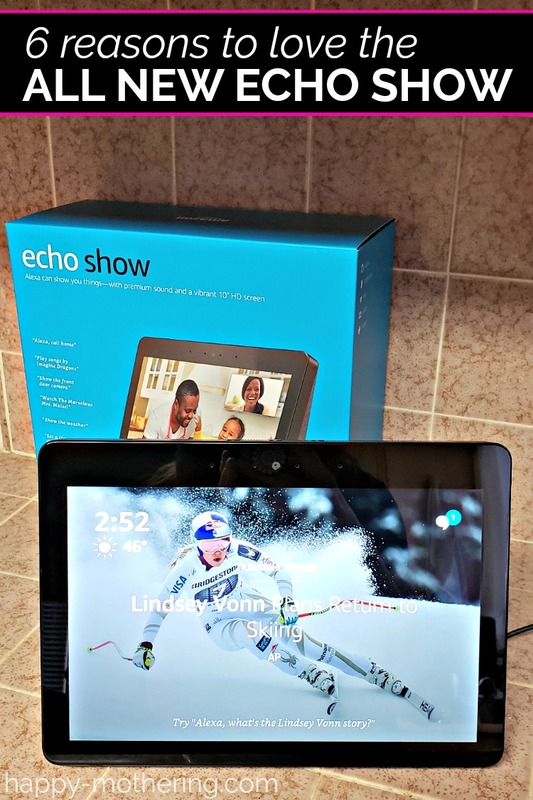 The reason I wanted the Echo Show rather than one of the smaller devices is the screen and the speakers. It seriously makes a huge difference! I’ll be honest. There is more of a learning curve with the Echo Show and Alexa than I anticipated. You have to program her with Skills (which are kind of like apps) to get Alexa to perform different functions. We’re still working on “training” Alexa with Skills to optimize her for helping our lives. You download the Alexa app to your phone to control these Skills and the other Alexa settings for your devices. While there is a learning curve, we’ve found over the last few weeks that it’s worth it. The Echo Show has a lot to offer. Here are some of our favorite features. 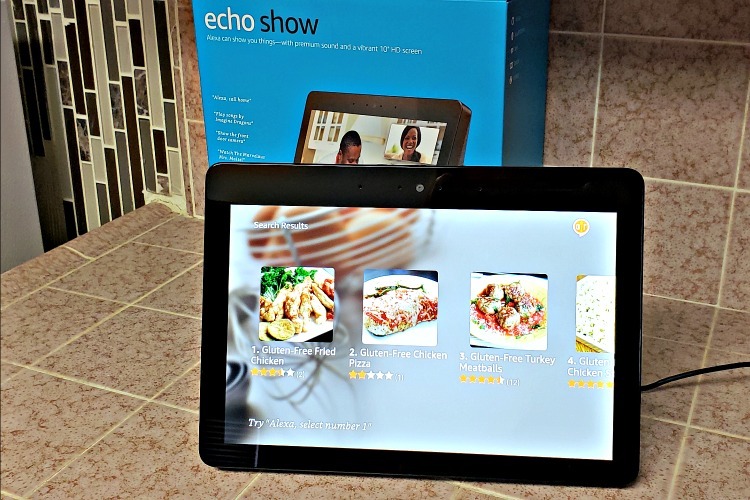 The Echo Show has a beautiful 10-inch HD screen, which makes watching my favorite shows easy when I’m in the kitchen cooking or cleaning. It makes chores much better! And you saw the premium speakers in the video, which feature Dolby processing, but the sound is seriously amazing. It resonates throughout the entire front of the house. I can walk out of the room and still hear my show – or my music. And Alexa can hear you from the other room, even if you have music playing! We pull up Pandora all the time on the Echo Show. We used to play it on the TV through our soundbar, but the sound from the Echo Show is so great that we don’t need to use the TV for that. I also really like that you can say, “Alexa, play songs from Artist’s Name,” and you’ll get a selection of songs on Amazon Music from that artist. I especially like that feature when I know I’m just going to be in the kitchen for a few minutes and want some music to keep me company. 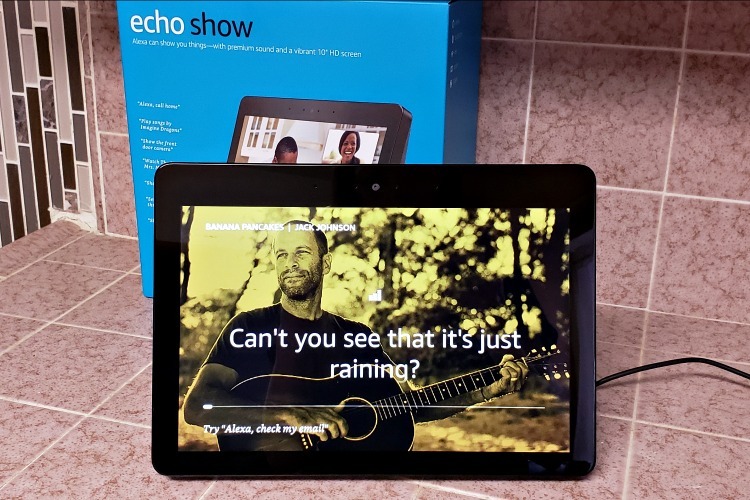 I love that the Echo Show shows you the lyrics to the songs it’s playing from Amazon Music. 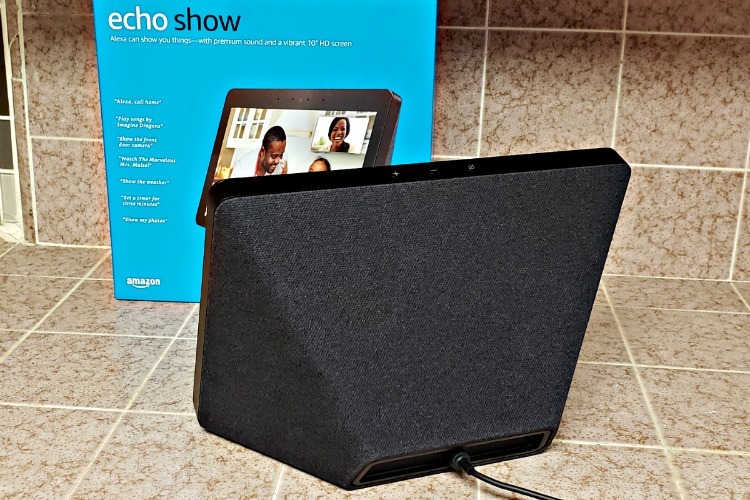 Your can also watch music videos from Vevo and use your Hulu subscription to watch live TV and sports in addition to your favorite shows and movies. Another favorite feature is the ability to pull up recipes. Do you ever walk into your kitchen and think, “What am I going to make for dinner tonight?” Just ask Alexa for a recipe using the ingredients you have and you can get some easy dinner recommendations. The recipes even come with with step-by-step cooking instructions and allow you to set timers and alarms. You can even add items to your shopping list. I asked Alexa to show me some gluten free dinner recipes and this is what I was presented with. I like that it’s usually a good variety of options that pop up, and not just a bunch of nearly identical recipes. I especially love being able to use voice command with the recipes on the Echo Show. I hate it when I end up with messy hands in the kitchen and I need to touch my phone to double check something on the recipe I’m working from. Who wants to touch their brand new phone with messy hands? 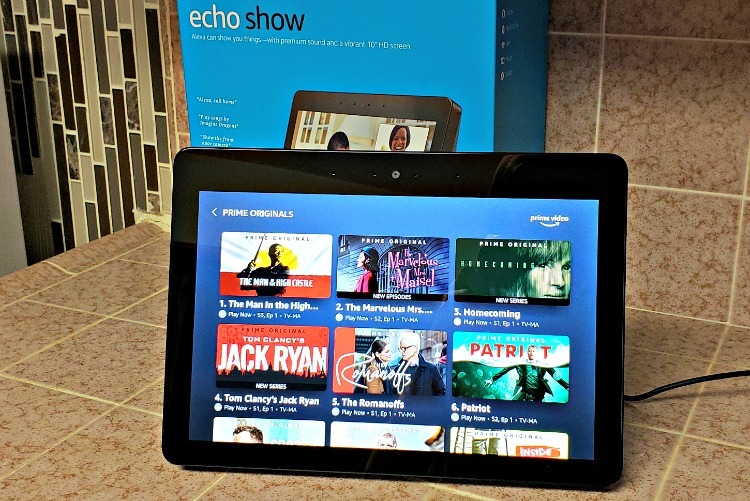 With the Echo Show, I can ask Alexa to help me out. It’s super convenient. Alexa can help you keep your life organized. When you wake up in the morning, you can ask Alexa for the weather forecast, what your commute looks like, what’s on your to-do list and more. You can ask, “Alexa, show me the news,” and Alexa will read you the news while you brew your morning coffee. It lets you pick from a few different news sources. If you’re in the kitchen, and have found that you’ve run out of your favorite coffee, you can say, “Alexa, order coffee,” and Alexa will place an order for coffee, trying to match it to your order history. That’s a great feature for forgetful people like me. You can just take care of it right away and not worry about it. If you don’t want her to order right away, you can ask Alexa to add the item to your cart. Need to catch up with family you haven’t talked to in a while? Use Skype to make video calls to your loved ones through the Echo Show while you cook dinner. Or take business calls from the kitchen or any room where you have an Echo Show device. The all new Echo Show features a built-in smart home hub. You can set up all of your Zigbee devices without needing a separate hub for them. You can even see your front door camera stream with 2-way audio and notifications. That would come in handy when we’re waiting for packages to be delivered. We don’t have smart lights or anything like that installed yet, but if you do, the Echo Show has extra cool features for you too. Simply walk in the room and say, “Alexa, turn on the lights,” and on they go. Pretty neat. The Echo Show is fun too. You can do more than watch shows on apps like Prime Video and Hulu. You can also add all sorts of Skills like having Alexa tell you jokes and flatter you. You can play games and solve riddles. There’s so much to explore. If you didn’t get an Echo Show for Christmas, the New Year is a great time to invest in one. It can help keep you organized, entertained and more this year. It retails for $229.99. Learn more here.